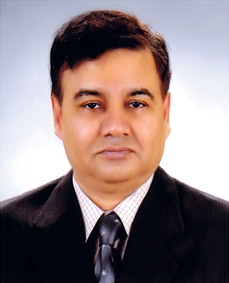 Al-Haj Abdul Kader Faruk aged 50, Chairman of the FAR Group born in well known business family in 1960 in Barisal. After completing his Masters in Commerce from Dhaka University he engages himself in business. He became a successful business man in short time of his business career with his sincerity, honesty, conceptual and practical problem solving minded. He has established and owner of different type of Industries including M.L. Dyeing Ltd.,R.N Spinning Mills Ltd.,M.L. Steel Mills Ltd.,Hotel Royal Tower Ltd.,FAR Homes Ltd., FAR Chemical Industries Ltd.,Chong Won ARS Sweater Ltd. and other organization. For over 20 years now, FAR Group has built a unique position in the Ready Made Garments sector by the unparalleled contributions in business and industrial fields and I, Al-Hajj Md. Abdul Kader Faruk am pleased to play a part as Chairman of the Managerial Board which has this responsibility. One of the primary roles of the managerial Board is to foster excellence by developing creative and innovative ways of investments in the industrial sector. It is a role that we take very seriously here at FAR, and one that demands hard work and tireless support of our faithful employees. Due to the vast portfolio of industries under the FAR Group, we have the advantage to offer products with the shortest delivery time at exceptional prices without any compromise in quality. By virtue of the existence of Modern in-house laboratory and Chemical industry, we are able to provide the optimum quality by developing samples and carrying out all types of tests at any time. Through the dedication, loyalty and commitment from every employee and worker, FAR Group has been able to maintain the high productivity and efficiency at every level of production. A unique family atmosphere exists within the organization to face challenges of the competitive world. In order to meet the growing demands we have been expanding our business considering all the recent product developments in the west and at the same time, prioritizing Bangladesh’s domestic market. It has been our vision to mitigate the unemployment crisis of our country and to establish Bangladesh’s grandeur in the international markets through our hard work and sincerity and through the continuous support and goodwill of our valuable clients the picture we painted of a prosperous Bangladesh in our minds is coming close to reality.